Every child has the potential to be a mini Mozart in the making. Still, deciding how much time and money to invest in your child’s musical future can be tricky. Once you’ve both decided on an instrument, the next step is signing up for lessons. When searching for the right teacher, though, it’s important to also determine whether group classes or private lessons are best for your child. We spoke with Louis Landrum, president of the Dallas Music Teacher’s Association, about the pros and cons of each method. 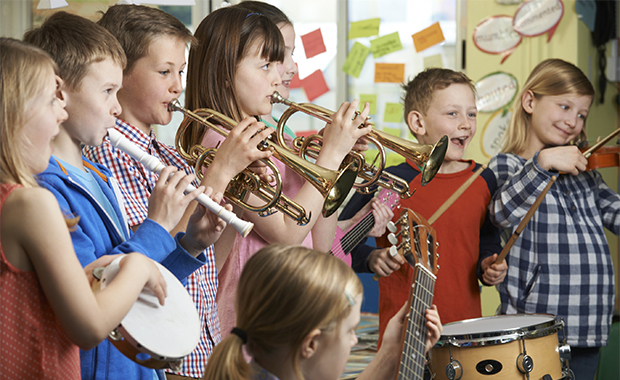 Group music lessons are similar to your child taking a group class in math or English. Like grade school classes, assignments are given to the group as a whole and are rarely tailored to each student. “When you’re in a class, you can only move as fast as the slowest student,” says Landrum, who has over 30 years of experience teaching piano and voice. If your child has a particular talent for playing an instrument, it can be difficult to develop or even recognize their abilities in a group class. Private lessons, on the other hand, give teachers the flexibility to give lessons and assignments that can improve specific skills a child might need to work on. In private lessons, students move at their own pace. They can blaze through or even skip things they’re good at, and spend more time on things they need to work on. According to Landrum, private teachers will assign specific lessons to help students with certain hand positions or rhythms they might need to work on. This sort of individualized lesson plan is not offered in a group class setting. While private lessons provide students with one-on-one training that can help them develop key skills, there are some benefits to enrolling your child in group lessons. Group lessons are often cheaper than private lessons, and this is one of the most important factors for some parents. A group music lesson can cost between $40 and $100 per month, while the average music teacher may charge up to $90 for just one private music lesson. Quantity doesn’t always equate quality. As with most things, you usually get what you pay for. Aside from the economic benefits, Landrum says some students respond well to a group setting. Group lessons give children the ability to develop socially by making new friends. It can also give them other people to collaborate with and learn from. Seeing their peers play can be a great motivator for students, too. Being around kids with different strengths can help your child inherit their desire and talent. “Some children respond to practice better when they know they are in a group setting,” Landrum says. As children get older, taking an orchestra or band class at school provides benefits all their own. Listening to instruments different from the ones your child plays will give them a completely different understanding of their own instrument. Also, working in a band or choir can teach your child a valuable lesson in teamwork, especially if they aren’t involved in any other extracurricular activities. “There are other great ways to learn teamwork besides sports,” Landrum says. It all depends on your child, but Landrum recommends starting with private lessons. After your child has taken a few private lessons, you both can determine what they want to get out of music. If they’re just pursuing music as a fun hobby, a group lesson can create an environment that has less pressure. Your child can get the social aspect and basic skills needed without things getting too serious, which may cause them lose interest in playing an instrument completely. If your child has a real talent and passion for music, private lessons are recommended. It can be difficult to grasp fundamental skills in a group setting, but personalized coaching creates an environment best suited for improvement.